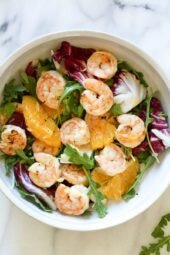 Grilled Shrimp Salad with Orange, Endive, Baby Arugula and Radicchio is the perfect light salad for Spring! This also happens to be Whole30, Dairy Free, Egg-Free and Gluten-Free. Now that the weather is warming up, I’ve been eating lots of salads! This one was so tasty, my husband loved it and it took less than 15 minutes to make. 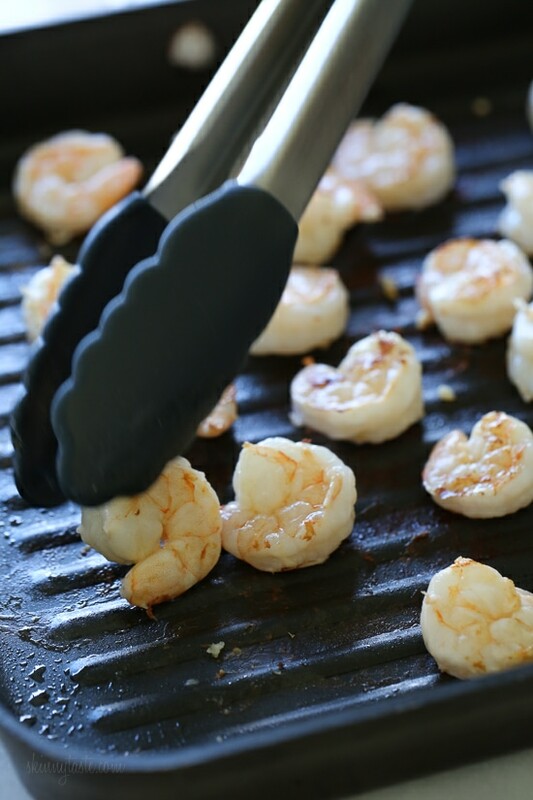 I used my grill pan, but you can also put the shrimp on skewers and grill them outdoors. Great warm or chilled if you want to make the shrimp ahead. 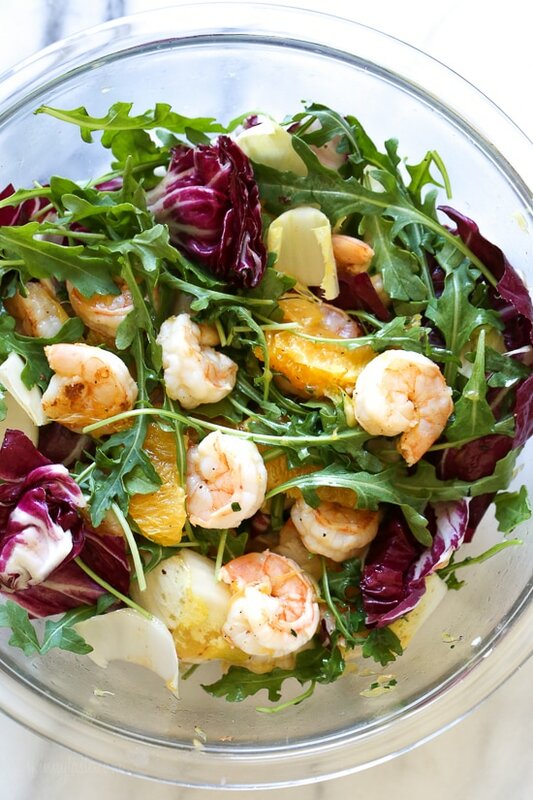 Grilled Shrimp Salad with Orange, Endive, Baby Arugula and Radicchio is the perfect light salad for Spring! In a large bowl season shrimp with 1/4 teaspoon salt, drizzle with 1 teaspoon oil and mix with garlic and juice from 1/2 lemon. 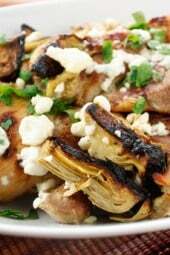 Prepare an outdoor grill or grill pan over medium-high heat. Spray the pan or grates, then grill the shrimp until just cooked through and opaque, about 2 minutes per side. Transfer to a large bowl to cool or refrigerate. Toss in the orange sections, juice from 1 orange, remaining lemon juice, arugula, endive and radicchio, drizzle the remaining 3 teaspoons olive oil, 1/4 teaspoon salt and fresh black pepper and serve right away. It seems nobody has actually made this, just looked at he picture maybe copied the ingredients for the shopping list but didn’t read the instructions, just like me. . I prepped all and assembled. Since I had cooked the shirmp I put it in the salad since it is shown in the the pictures. I’ve made many of your recipes and ‘this is the first blooper I’ve encountered, It looks good, ready to eat it now. Hey Barb! 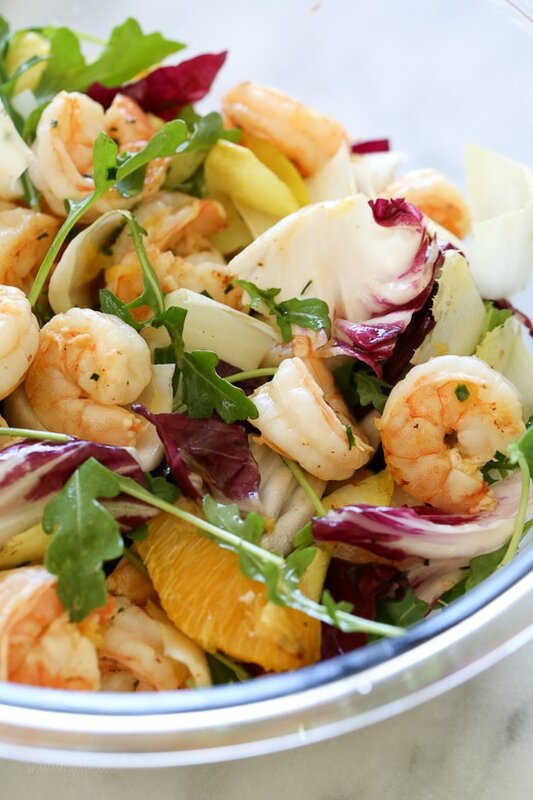 You are supposed to cook (grill) the shrimp, cool and then add everything else…hope you enjoyed it! 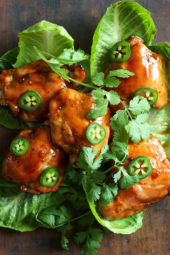 Thank you for this recipe and blog! This shrimp saved my life earlier this week. I’m on WW and had an incident at the office – cake and cookies involved, it wasn’t pretty – but I still got to have a terrific meal thanks to you! One question, if you don’t mind? How does the timing and cooking change if you start with frozen raw shrimp? I had fresh this week, but I’m considering stocking up for the future! Thanks again! Cannot wait to try this delicious looking salad! 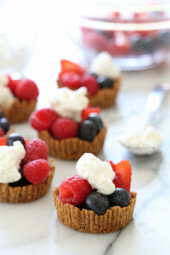 Just saved to my Pinterest board, will be making this week! Could you please tell me what kind of grill pan do you use? I want to make more of your shrimp recipes, but I don’t have time to soak and thread skewers. Thanks for all you share with us! I have a Le Crueset and a Calphalon nonstick. This looks delicious! I can’t wait to try it…. glad spring foods are here so I can slim up for summer!